Cherkasy Oblast (Ukrainian: Черкаська область, translit. Cherkas’ka oblast’; referred tae as Черкащина an aw, Cherkashchyna) is an oblast (province) o central Ukraine locatit alang the Dnieper River. The admeenistrative centre o the oblast is the ceety o Cherkasy). Wi 20,900 km², the Cherkasy oblast is the 18t lairgest oblast o Ukraine, comprisin aboot 3.5% o the aurie o the kintra. The sooth flowin Dnieper River wi the hilly wastren bank an the plain eastren bank divides the oblast intae twa unequal pairts. The lairger wastren pairt belangs tae the Dnieper Upland. The law-lyin eastren pairt o the oblast uised tae be subject tae the frequent Dnieper floodin afore the flow o the river became controlled bi multiple dams o Hydroelectric Pouer Plants constructit alang the river in the 20t century. The Ros River near Korsun-Shevchenkivskyi. The oblast extends for 245 km frae soothwast tae northeast, an for 150 km frae north tae sooth. The northren-maist pynt o the oblast is locatit is near the veelage o Kononivka in the Drabivskyi Raion (destrict), the soothmaist pynt near the veelage o Kolodyste in the Talnivskyi Raion, the wastmaist pynt near the veelage o Korytnya in the Zhashkivskyi Raion, an the eastmaist pynt near the veelage o Stetsivka in the Chyhyrynsky Raion. The geometric centre o the oblast is locatit near the veelage Zhuravky o the Horodyshchenskyi Raion. The oblast borders the Kiev Oblast tae the north, the Kirovohrad Oblast tae the sooth, the Poltava Oblast tae the east, an the Vinnytsya Oblast tae the wast. The Cherkasy Oblast wis creatit as pairt o the Ukrainian Soviet Socialist Republic on 7 Januar 1954. The oblast's territory wis the major ceeties o Cherkasy, Smila an Uman, thair correspondin raions (destricts), as well as 30 umwhile raions o the Vinnytsia, Kiev, Kirovohrad an Poltava Oblasts. Airchaeological discoveries, hae shawn that fowk hae inhabitit the valley o the Dnieper (Dnipro) River wyne the times immemorial. The auldest objects excavatit on the territory o the region date back tae the Stane Age – the Palaeolithic period. Cherkasy Oblast is admeenistratively subdividit intae 20 raions (destricts), as well as 6 ceeties (municipalities) which are directly subordinate tae the oblast govrenment: Vatutine, Zolotonosha, Kaniv, Smila, an the admeenistrative centre o the oblast, Cherkasy. Thare are a tot o 25 ceeties, 34 touns, an 838 veelages. The local admeenistration o the oblast is controlled bi the Cherkasy Oblast Rada. The govrenor o the oblast is the Cherkasy Oblast Rada speaker, appointit bi the Preses o Ukraine. Cairt o the raions (destricts) o Cherkasy Oblast. A kirk in Subotiv near Chyhyryn, the birthplace o Ukrainian Hetman Bohdan Khmelnytsky. The Sviato-Uspenskyi Cathedral in Zolotonosha. The current estimatit population is 1,335,064 (as o 2006). Accordin tae the 2001 Ukrainian census, the oblast's population is amaist equally dividit atween the urban an rural auries (53.7% an 46.3%, respectively). The demographic situation in this lairgely agricultural territory is somewha complicatit bi population agein. Bi ethnic composition, Ukrainians represent the owerwhelmin majority o the oblast's population (93.6%). Ethnic Roushies are the distant seicont group o population (5.4%), an are concentratit mainly in the ceety o Cherkasy. The oblast is primarily Ukrainophone. The economy o the Cherkasy Oblast is lairgely dominatit bi agricultur. While the winter wheat an sugar beets are the main products grown in the oblast, baurley, corn, tobacco an hemp are grown an aw. Cattle breedin is important an aw. The industry is mainly concentratit in Cherkasy, the oblast's caipital an the lairgest ceety. A chemical industry wis developit in the ceety in late 1960s in addition tae machine biggin, furnitur makkin an agricultural processin. Maist o Ukraine's oblasts are namit efter thair caipital ceeties, offeecially referred tae as "oblast centers" (Ukrainian: обласний центр, translit. oblasnyi tsentr). 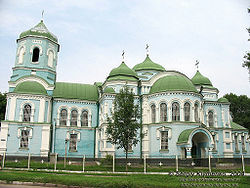 The name o each oblast is a relative adjective, formit bi addin a feminine suffix tae the name o respective centre ceety: Cherkasy is the centre o the Cherkas’ka oblast’ (Cherkasy Oblast). Maist oblasts are whiles referred tae in a feminine noun form an aw, follaein the convention o traditional regional place names, endin wi the suffix "-shchyna", as is the case wi the Cherkasy Oblast, Cherkashchyna. ↑ "General results of the census / Urban and rural population / Cherkasy region". 2001 Ukrainian Census. Retrieved 2007-06-03. ↑ "General results of the census / Age composition of population / Cherkasy region". 2001 Ukrainian Census. Retrieved 2007-06-03. ↑ "General results of the census / National composition of population / Cherkasy region". 2001 Ukrainian Census. Retrieved 2007-06-03. 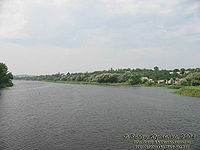 "Cherkasy Region". Cabinet of Ministers of Ukraine. Retrieved 2007-06-01. Wikimedia Commons haes media relatit tae Cherkasy Oblast. This page wis last eeditit on 4 Julie 2018, at 18:50.